Anthropologist John Wilson on "An Archaeologist's View of the 1676 Falls Fight: Weapons, Tactics & Terrain." Phil Kantor, former Society president, on "Conway During Shays' Rebellion," 230 years ago. Sarah Doyle, of the Impressions from a Lost World website (PVMA), on Edward & Orra Hitchcock: Religion, Science, and Art in Conway & Amherst. Robert Nowak, resident amateur geologist, on "Hidden in the Rocks: After the Continents Collided," a presentation on Conway's geology and the components and formations of Bob's rocky Whately Road hillside. Bill Burnett, a 7th generation Burnett family member who traces his Conway lineage to 1781, on "Mapping Conway's Early Roads and Foundations," an ongoing project. David Brule, president of the Nolumbeka Project and author of Looking for Judah: Adventures in Genealogy and Remembrance, on the tribal presence in the area from the time of Lake Hitchcock to the present. Local educator and author Jeremy V. P. Rogers on "Conway in Context: 18,000 Years of History." Kathy Kennedy Llamas and her one-woman show, "An Evening with Mary Todd Lincoln." 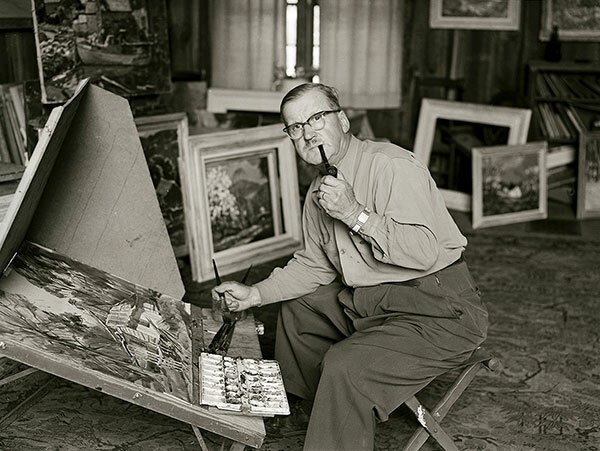 W. Lester Stevens painting in his studio, 1953.